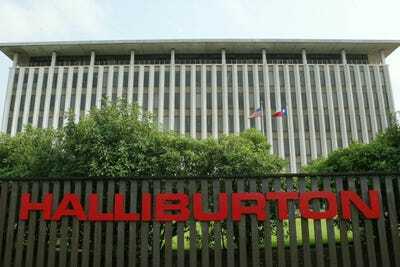 Halliburton is buying Baker Hughes for $US34.6 billion, the company has announced. 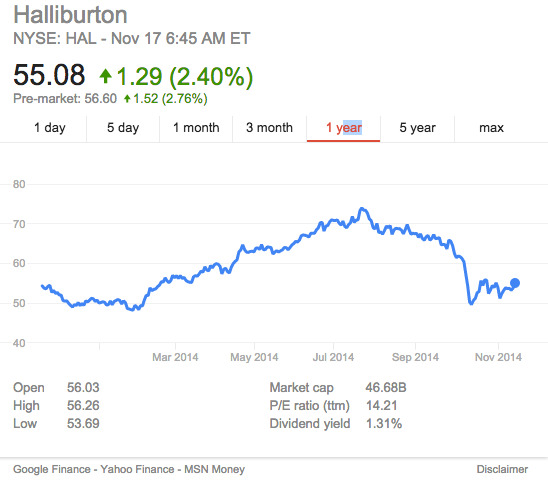 The deal is at $US78.62/share — based on Halliburton’s closing on Nov. 12. — and the equity value of deal is $US34.6 billion. On Friday, Halliburton moved to overthrow the board of Baker Hughers after negotiations hit a snag. Bloomberg reported that the two sides anticipated they would need to sell up to $US10 billion in assets for the deal to receieve regulatory approval. 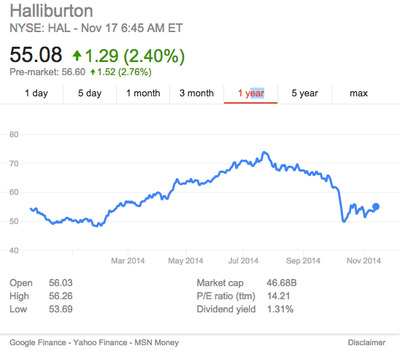 Like many oil companies, Halliburton has seen it shares fall with dropping oil prices. The offer is a 31% premium to Baker Hughes’ Friday close on the New York Stock Exchange, Reuters notes. Halliburton Company (HAL) and Baker Hughes Incorporated (BHI) today announced a definitive agreement under which Halliburton will acquire all the outstanding shares of Baker Hughes in a stock and cash transaction. The transaction is valued at $US78.62 per Baker Hughes share, representing an equity value of $US34.6 billion and enterprise value of $US38.0 billion, based on Halliburton’s closing price on November 12, 2014, the day prior to public confirmation by Baker Hughes that it was in talks with Halliburton regarding a transaction. Upon the completion of the transaction, Baker Hughes stockholders will own approximately 36 per cent of the combined company. The agreement has been unanimously approved by both companies’ Boards of Directors. The transaction combines two highly complementary suites of products and services into a comprehensive offering to oil and natural gas customers. On a pro-forma basis the combined company had 2013 revenues of $US51.8 billion, more than 136,000 employees and operations in more than 80 countries around the world. Under the terms of the agreement, stockholders of Baker Hughes will receive, for each Baker Hughes share, a fixed exchange ratio of 1.12 Halliburton shares plus $US19.00 in cash. The value of the merger consideration as of November 12, 2014 represents 8.1 times current consensus 2014 EBITDA estimates and 7.2 times current consensus 2015 EBITDA estimates. The transaction value represents a premium of 40.8 per cent to the stock price of Baker Hughes on October 10, 2014, the day prior to Halliburton’s initial offer to Baker Hughes. And over longer time periods, based on the consideration, this represents a one year, three year and five year premium of 36.3 per cent, 34.5 per cent, and 25.9 per cent, respectively. The transaction is subject to approvals from each company’s stockholders, regulatory approvals and customary closing conditions. Halliburton’s and Baker Hughes’ internationally recognised advisors have evaluated the likely actions needed to obtain regulatory approval, and Halliburton and Baker Hughes are committed to completing this combination. Halliburton has agreed to divest businesses that generate up to $US7.5 billion in revenues, if required by regulators, although Halliburton believes that the divestitures required will be significantly less. Halliburton has agreed to pay a fee of $US3.5 billion if the transaction terminates due to a failure to obtain required antitrust approvals. Halliburton is confident that a combination is achievable from a regulatory standpoint. Leverages complementary strengths to create a company with an unsurpassed breadth and depth of products and services.The companies are highly complementary from the standpoint of product lines, global presence and cutting-edge technology in the worldwide oil and natural gas industry. The resulting company will provide a comprehensive suite of products and services to customers in virtually every oil and natural gas producing market in the world. This strategic combination will create an oilfield services supplier with the ability to serve customers through strong positions in key business lines, a fully integrated product and services platform, increased capabilities in the unconventional, deepwater and mature asset sectors, substantial and improved growth opportunities and continued high returns on capital. Generates significant opportunities for synergies. In addition to the compelling and immediate premium Baker Hughes stockholders will receive, the transaction will also yield significant synergies. The combination will provide substantial efficiencies of scale and geographic scope, particularly in the Eastern Hemisphere, which will enhance fixed cost absorption. Once fully integrated, Halliburton expects the combination will yield annual cost synergies of nearly $US2 billion. These synergies are expected to come primarily from operational improvements, especially North American margin improvement, personnel reorganization, real estate, corporate costs, R&D optimization and other administrative and organizational efficiencies. Halliburton (HAL) and Baker Hughes (BHI) will host a conference call on Monday, November 17, 2014, to discuss the proposed business transaction. The call will begin at 7:00 AM Central Time (8:00 AM Eastern Time). An accompanying slide deck will be posted to both the Halliburton and Baker Hughes websites at www.halliburton.com and www.bakerhughes.com/investor. Please visit either website to listen to the call live via webcast. In addition, you may participate in the call by dialling (866) 225-4091 within North America or (703) 639-1128 outside North America. A passcode is not required. Attendees should log in to the webcast or dial in approximately 15 minutes prior to the call’s start time. Founded in 1919, Halliburton is one of the world’s largest providers of products and services to the energy industry. With more than 80,000 employees, representing 140 nationalities in over 80 countries, the company serves the upstream oil and gas industry throughout the lifecycle of the reservoir – from locating hydrocarbons and managing geological data, to drilling and formation evaluation, well construction and completion, and optimising production through the life of the field. Visit the company’s website at www.halliburton.com. Connect with Halliburton onFacebook, Twitter, LinkedIn, Oilpro and YouTube. Baker Hughes is a leading supplier of oilfield services, products, technology and systems to the worldwide oil and natural gas industry. The company’s 61,000 employees today work in more than 80 countries helping customers find, evaluate, drill, produce, transport and process hydrocarbon resources. For more information on Baker Hughes, visit: www.bakerhughes.com. The statements in this press release that are not historical statements, including statements regarding the expected timetable for completing the proposed transaction, benefits and synergies of the proposed transaction, future opportunities for the combined company and products, future financial performance and any other statements regarding Halliburton’s and Baker Hughes’ future expectations, beliefs, plans, objectives, financial conditions, assumptions or future events or performance that are not historical facts, are forward-looking statements within the meaning of the federal securities laws. These statements are subject to numerous risks and uncertainties, many of which are beyond the company’s control, which could cause actual results to differ materially from the results expressed or implied by the statements. These risks and uncertainties include, but are not limited to: failure to obtain the required votes of Halliburton’s or Baker Hughes’ stockholders; the timing to consummate the proposed transaction; satisfaction of the conditions to closing of the proposed transaction may not be satisfied or that the closing of the proposed transaction otherwise does not occur; the risk that a regulatory approval that may be required for the proposed transaction is not obtained or is obtained subject to conditions that are not anticipated; the diversion of management time on transaction-related issues; the ultimate timing, outcome and results of integrating the operations of Halliburton and Baker Hughes and the ultimate outcome of Halliburton’s operating efficiencies applied to Baker Hughes’ products and services; the effects of the business combination of Halliburton and Baker Hughes, including the combined company’s future financial condition, results of operations, strategy and plans; expected synergies and other benefits from the proposed transaction and the ability of Halliburton to realise such synergies and other benefits; expectations regarding regulatory approval of the transaction; results of litigation, settlements, and investigations; final court approval of, and the satisfaction of the conditions in, Halliburton’s September 2014 settlement relating to the Macondo well incident in the Gulf of Mexico; appeals of the multi-district litigation District Court’s September 2014 ruling regarding Phase 1 of the trial, and future rulings of the District Court; results of litigation, settlements, and investigations not covered by the settlement or the District Court’s rulings; actions by third parties, including governmental agencies, relating to the Macondo well incident; BP’s April 2012 settlement relating to the Macondo well incident, indemnification, and insurance matters; with respect to repurchases of Halliburton common stock, the continuation or suspension of the repurchase program, the amount, the timing and the trading prices of Halliburton common stock, and the availability and alternative uses of cash; actions by third parties, including governmental agencies; changes in the demand for or price of oil and/or natural gas can be significantly impacted by weakness in the worldwide economy; consequences of audits and investigations by domestic and foreign government agencies and legislative bodies and related publicity and potential adverse proceedings by such agencies; protection of intellectual property rights and against cyber attacks; compliance with environmental laws; changes in government regulations and regulatory requirements, particularly those related to offshore oil and natural gas exploration, radioactive sources, explosives, chemicals, hydraulic fracturing services and climate-related initiatives; compliance with laws related to income taxes and assumptions regarding the generation of future taxable income; risks of international operations, including risks relating to unsettled political conditions, war, the effects of terrorism, and foreign exchange rates and controls, international trade and regulatory controls, and doing business with national oil companies; weather-related issues, including the effects of hurricanes and tropical storms; changes in capital spending by customers; delays or failures by customers to make payments owed to us; execution of long-term, fixed-price contracts; impairment of oil and natural gas properties; structural changes in the oil and natural gas industry; maintaining a highly skilled workforce; availability and cost of raw materials; and integration of acquired businesses and operations of joint ventures. Halliburton’s and Baker Hughes’ respective reports on Form 10-K for the year ended December 31, 2013, Form 10-Q for the quarter ended September 30, 2014, recent Current Reports on Form 8-K, and other U.S. Securities and Exchange Commission (the “SEC”) filings discuss some of the important risk factors identified that may affect these factors and Halliburton’s and Baker Hughes’ respective business, results of operations and financial condition. Halliburton and Baker Hughes undertake no obligation to revise or update publicly any forward-looking statements for any reason. Readers are cautioned not to place undue reliance on these forward-looking statements that speak only as of the date hereof. This communication does not constitute an offer to buy or sell or the solicitation of an offer to buy or sell any securities or a solicitation of any vote or approval. This communication relates to a proposed business combination between Halliburton and Baker Hughes. In connection with this proposed business combination, Halliburton and/or Baker Hughes may file one or more proxy statements, registration statements, proxy statement/prospectus or other documents with the SEC. This communication is not a substitute for any proxy statement, registration statement, proxy statement/prospectus or other document Halliburton and/or Baker Hughes may file with the SEC in connection with the proposed transaction. INVESTORS AND SECURITY HOLDERS OF HALLIBURTON AND BAKER HUGHES ARE URGED TO READ THE PROXY STATEMENT(S), REGISTRATION STATEMENT(S), PROXY STATEMENT/PROSPECTUS AND OTHER DOCUMENTS THAT MAY BE FILED WITH THE SEC CAREFULLY AND IN THEIR ENTIRETY IF AND WHEN THEY BECOME AVAILABLE BECAUSE THEY WILL CONTAIN IMPORTANT INFORMATION. Any definitive proxy statement(s) (if and when available) will be mailed to stockholders of Halliburton and/or Baker Hughes, as applicable. Investors and security holders will be able to obtain free copies of these documents (if and when available) and other documents filed with the SEC by Halliburton and/or Baker Hughes through the website maintained by the SEC at http://www.sec.gov. Copies of the documents filed with the SEC by Halliburton will be available free of charge on Halliburton’s internet website athttp://www.halliburton.com or by contacting Halliburton’s Investor Relations Department by email at [email protected] or by phone at +1-281-871-2688. Copies of the documents filed with the SEC by Baker Hughes will be available free of charge on Baker Hughes’ internet website at http://www.bakerhughes.com or by contacting Baker Hughes’ Investor Relations Department by email at [email protected] or [email protected] or by phone at +1-713-439-8039 or +1-713-439-8822.